“Apple Computer, humbled by two unspectacular computer introductions in three years, is betting it has a winner in the $2,495 Macintosh, a 20-pound, 32-bit computer,” the magazine said. InfoWorld then went on to give the Mac a massive stamp of approval. “We all believe it’s a fantastic machine,” Ken Lim, a Dataquest analyst, told InfoWorld as he testified about the Mac. “It’s certainly the best price/performance ratio of anything that’s on the marketplace. It’s an excellent value for the consumer.” Lim went on to suggest that the Mac would sell in similar quantities to the Apple II, which had then sold 1.5 million units. Plenty of interesting (and today amusing) tidbits surface in InfoWorld’s other articles about the Mac. One writer tackles the question, “Is 128K enough RAM?” That must seem virtually impossible to anyone who doesn’t remember further back than the iPhone. “One of those companies, Microsoft, has been working closely with Apple for more than a year,” the magazine added. Just a year later, Apple CEO John Sculley signed a disastrous deal with Microsoft co-founder Bill Gates. This kept Microsoft software on Macs. However, it pretty much gave Microsoft carte blanche to create its Mac-styled Windows operating system. The one other thing likely to come as a shock to modern Apple fans is just how expensive everything was. The Mac cost $2,495, which today is almost $5,800. That’s not so bad, actually. But the price of Mac software — which now ships free from Apple, and tends to be reasonably priced from third-party devs — was also high. MacPaint and MacWrite, two of the best-known pieces of Mac software, did not come bundled with the machine. They cost $195 as a package (the equivalent of $450 today). MacTerminal cost another $99 ($229 today). Everything else came in somewhere between $99 and $125. 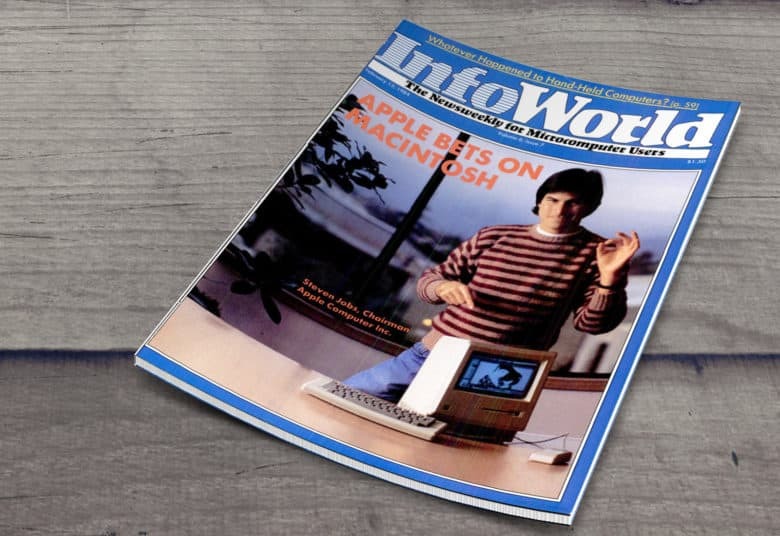 Check out the full InfoWorld magazine article about the Macintosh for a closer look at the computer’s arrival.